It’s become something of a mantra among U.S. investors: diversify overseas to boost returns and protect assets. In recent years, investing in foreign markets has been widely seen as a way to counter the risks associated with investing at home. These risks include the fallout from America’s ongoing fiscal woes, the restructuring of an overly consumer-dependent economy, and a relentless long-term decline in the value of the dollar. Proponents also argue that it is the only way to capitalise on “the levelling of the global economic playing field,” as lesser-developed countries around the world, including high-flyers like China, India, and Brazil, play catch-up with the likes of America and Western Europe. The truth is, however, that U.S. and overseas markets have become tightly-linked, at least from the point of view of dollar-based investors. While there was a time when share prices here and elsewhere moved to their own tunes, that no longer seems to be the case. 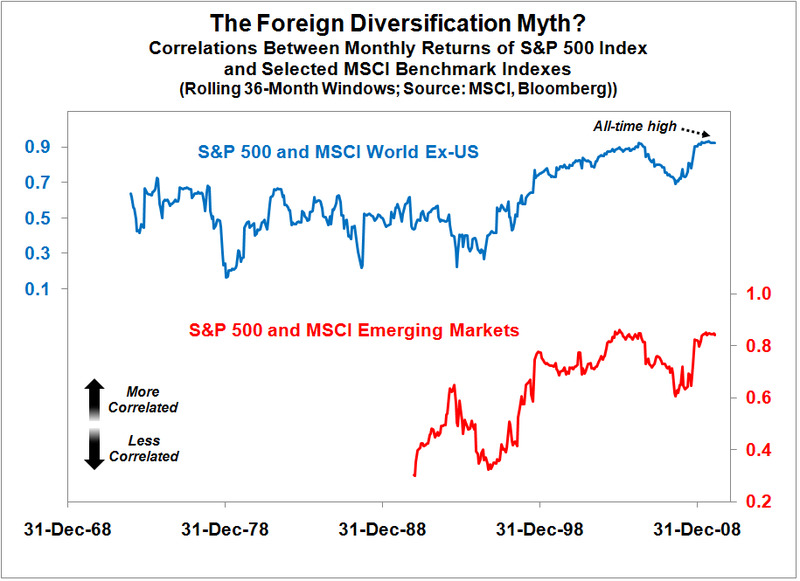 In fact, based on an analysis of data going back several decades, the correlation between monthly returns for the S&P 500 index and a broad global benchmark, the MSCI World Ex-US index, has never been greater. 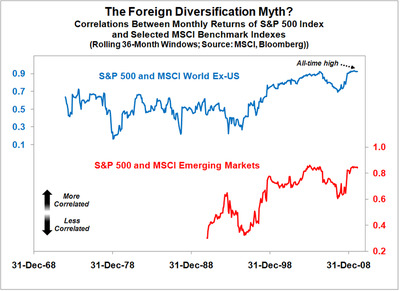 More surprising to some, perhaps, is the fact that emerging market returns have also become increasingly correlated to those of the U.S.
Why has this happened? The most likely reasons include the effects of increasing globalization, rising cross-border capital flows, the growing influence of large-scale multinational corporations, greater use of offshoring and outsourcing, and the information-spreading power of global media firms and the internet. Will things remain that way? In the long-run, most likely not. As those who have read my books and blogs know, I believe America’s role in the world will eventually change for the worse. However, for the time being, at least, those who think they are protecting themselves by investing in foreign stocks may not realise the benefits they were hoping for.